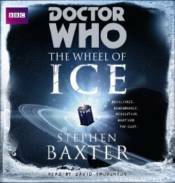 Be prepared for chills and thrills in Doctor Who: Wheel of Ice, an unabridged reading of a brand new BBC Books novel which features a ring of ice and steel turning around a moon of Saturn, home to a colony mining minerals for a resource-hungry future Earth. Aboard the Wheel the Second Doctor, Jamie and Zoe find a critical situation � and three strangers who have just turned up out of nowhere look like prime candidates to be accused of sabotage � The Doctor finds himself caught up in a mystery that goes right back to the creation of the solar system. A thrilling, all-new adventure written by Stephen Baxter and featuring the Second Doctor. The reader is David Troughton, son of Patrick Troughton who played the Second Doctor himself in the BBC TV series.